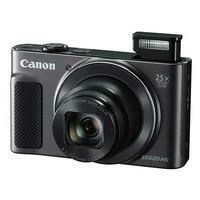 The Canon PowerShot SX620 in black is a travel zoom compact packing a versatile 25x zoom (25-625mm equivalent) and 20.2-megapixel BSI CMOS sensor inside a tiny, pocketable design. With built-in Wi-Fi and NFC connectivity, this stylish camera has all the features you need to capture detailed photos and crisp Full HD movies and seamlessly share them via your smart device. Wrist Strap (WS-800), Battery Pack (NB-13L), Battery Charger (CB-2LHE), AC Cable and User Manual.